Education diplomacy is important for building mutually beneficial and reciprocal relationships between countries. The Department supports diplomacy through almost all of its international activities. By building and fostering relationships with government officials, policy makers, researchers, educators, students and other professionals around the world, providing leadership on education issues, collaborating with other U.S. government agencies and learning with other countries, the Department is helping to further global stability and progress and, in turn, facilitate a world-class education at home and abroad. This soft diplomacy contributes to our national security, our credibility as a leader among nations and, ultimately, our national prosperity. 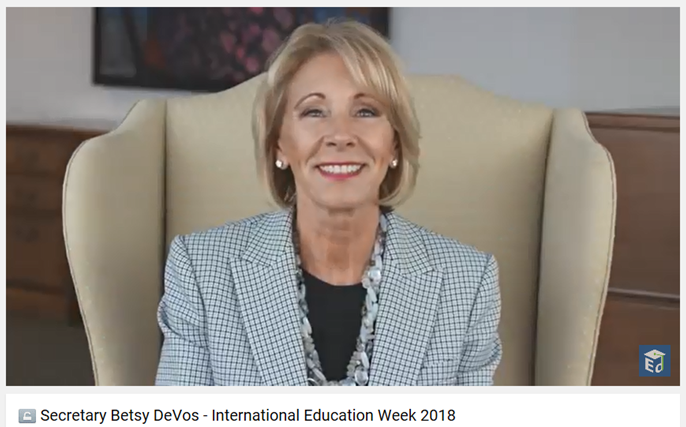 The Department addresses this objective by engaging bilaterally with other countries, participating in multilateral organizations, and hosting visitors who come to the United States to learn about U.S. education and share information about their countries. The Department addresses education-related issues with individual countries on a bilateral basis and with multilateral organizations—such as Asia-Pacific Economic Cooperation (APEC), the Organization of American States (OAS) and OECD—and multilateral forums—such as the Summit of the Americas and the G20, a leading forum of the world’s major economies that seeks to develop global policies to address today’s most pressing challenges. In these activities the Department works with its counterparts to share best practices and lessons learned in order to improve education here and abroad. The Department also participates in reviewing and developing declarations, resolutions and reports. Education diplomacy is an important component of U.S. engagement that builds goodwill and provides an avenue for regular and positive engagement with other countries. Argentina hosted the first-ever G20 Education Ministerial and Joint Education-Employment Ministerial in September 2018, elevating the central role of education, skills and employment across the globe. The declarations adopted by the G20 countries are consistent with the Administration’s agenda regarding education being aligned with workforce skills and industry demands, the need for lifelong learning and flexible pathways. The outcomes of these meetings will be used in the G20 Leaders meeting to further elevate the importance of education and skills in the global agenda. Also related to education diplomacy is the Department’s work on issues related to academic and professional mobility. Among other things, the Department participates in the European Network of Information Centers (ENIC), which promotes the recognition of education qualifications between countries. As part of ENIC, the Department provides information about U.S. education to counterparts in other countries in an effort to facilitate the recognition of U.S. degrees abroad, offers guidance to U.S.-educated persons interested in working or pursuing further studies abroad, and responds to inquiries from individuals with non-U.S. degrees who wish to better understand how their degrees can be used to work or study in the United States. The Department regularly hosts visitors in key fields as part of the State Department’s International Visitor Leadership Program (IVLP). This program helps to strengthen U.S. relations with other countries by providing emerging leaders with the opportunity to experience firsthand U.S. political, economic, social and cultural life and to build long-lasting connections between Americans and groups from other countries. The State Department estimates that 565 of these emerging leaders have become heads of government since IVLP began. In addition, the Department hosts high-level government officials who come to engage with the Secretary and other senior officials in order to learn about current initiatives in U.S. education and to share information about their countries’ education systems and political conditions. On average, the Department hosts more than 1,200 visitors from more than 140 countries each year. Taken together, these activities and interactions provide many important opportunities to learn from and share with other countries and to continue to foster strategic relationships. Return to International Strategy. Go to Objective 1, Objective 2.